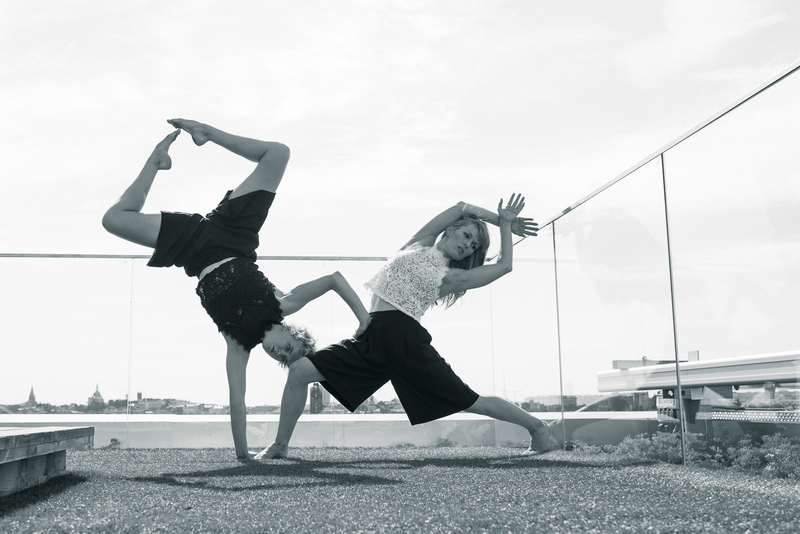 Sabrina Phillip and her assistant Abby Lett were in Stockholm for two weeks holding classes at Balletakademien. Through Tilda Kristiansson I got in touch with them, and we arranged to meet up on the rooftop terrace of Scandic Continental located at the heart of Stockholm for a photoshoot. The view is amazing from up there, if you have a chance, go check it out! When on a rooftop located in central Stockholm you have to make sure to include some landmarks, and what symbolises Stockholm more than the old City Hall where the Nobel Prize Banquet takes place? This is not really a dance photo, but I liked the mood in this photo of Abby. Sabrina Phillip. Here I am shooting against the sun and Abby is standing behind me holding up a silver reflector to light Sabrina. Planking is still a thing, especially if you are twelve floors up. You are not actually supposed to do this, as a friendly security guard informed us after we finished. Abby on the right side of the glass wall. We also experimented with including a bit of the rooftop furniture in the photos. As a photographer you have some difficult choices. If you shoot higher up, you see more of the surrounding city, but if you shoot lower, as here, the pose appears clearer against the sky. Here we were experimenting with reflections. Because it was such a bright day we could only get a good reflection in the part of the glass wall that had the building behind it. Here Sabrina Phillip. Abby Lett doing push-ups, or well, not really. There was a spot where I was able to get up higher than the dancers, and shoot down at them. Here Sabrina on the floor, but with the hair flick it almost looks as she is falling. Abby Lett with the City Hall in the background. We also did a few group photos of Abby and Sabrina. Final photo, Sabrina and Abby resting in the comfortable sundeck chairs on the rooftop terrace. A big thank you to Sabrina and Abby, and to Scandic Continental for letting us use their beautiful rooftop terrace! If you want to see more of Sabrina she has a Youtube Channel. Want to see more dancing, click here for a random dance blog post.